This is an authentic replica of a 1750 era, folding style instrument which shows direction as well as time. It features a folding gnomon and antique style face, hand-lettered on parchment colored paper in the original hues of red and blue. 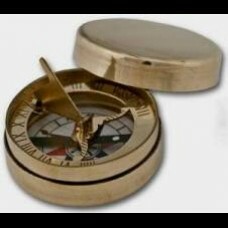 This striking and unique instrument is housed in a beautiful solid brass case, 1-3/4" in diameter and is suitable for engraving.